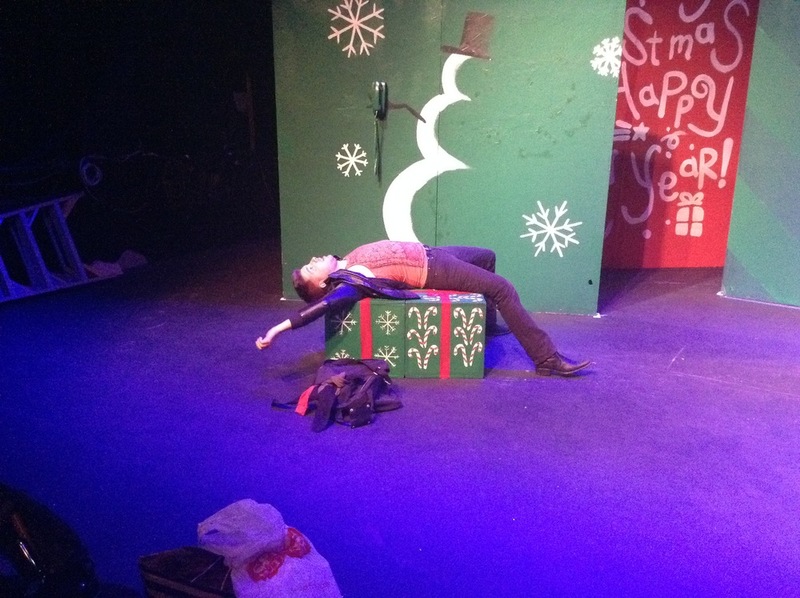 Rehearsal fun with "Naughty or Nice"
We've been lagging on the blogs, but only because we're busy bees! Check out all the fun that's happening in rehearsals for "Naughty or Nice" with this collection of rehearsal shots from tech this weekend, and then click the button to the left fo tickets! Father and son, but not what you think...these two are the cutest. Sometimes a discount Santa (Beth Galllagher) will have to do! Just a couple of Elves hanging out! Aunt Betty (Rhys Green) is a babe! Wait until you meet her! Mickey (Tony Houck) is a handful. Some fun lighting (by Bonnie Breckenridge). I'm not even going to tell you what's happening here. You'll just have to see! We can't wait to share these two unique holiday productions with you, kicking off THIS WEEK. Get your tickets today friends! Two different collections of short plays by Nick Crosby, Paul Georgeades, Kristen Fogle, Katherine Harroff, Neil McDevitt, Soroya Rowley, and April Ventura. Directed by Patrick Kelly and Soroya Rowley. 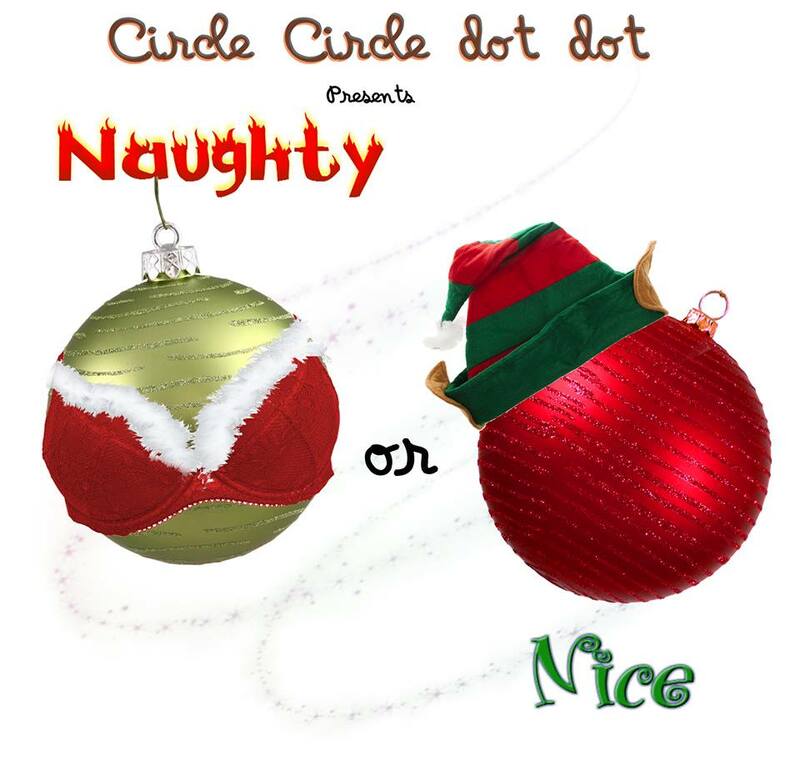 Just in time for the holidays, Circle Circle dot dot is pleased to present two separate series of short plays inspired by contemporary stories of Christmas revelry. "Naughty or Nice" will feature original premiere scripts from 9 local playwrights featuring hilarious tales- some appropriate for all audiences, some not so much. Muzal the Elf wants more from life than sweets and toys. What happens when Santa makes a mistake? Can a Christmas be Merry for everyone? Going back home for the Holidays is fun for everyone, right? Christmas is the perfect time for sexual experimentation. What does someone that has everything want for the holidays? What would you say if you knew it was the last time they'd call? Anyone have the need for an angry matriarch this season? *Adult themes and language are used in 'Naughty'. All-ages are welcome to attend 'Nice'. Tony Houck, Kevane La'Marr Coleman, Beth Gallagher, Taylor Wycoff, Alexandra Slade, Kristin McReddie, and Rhys Green. Each cast member will be playing multiple roles in both collections. Thursday-Friday 6:30pm(Nice) 9pm (Naughty); Saturday-Sunday 4pm (Nice), 8pm (Naughty). 930 10th Ave. San Diego, CA 92101. NICE: $5 (children under 13), $10 (adults). NAUGHTY: $10 (students, seniors), $15 (general). Much more to come very soon! Thanks for letting us take a much-needed breather! Thank You for this wonderfully spacey experience! Thank You to everyone who has or will see "Red Planet Respite". As we prepare to close the first show of our 2014/15 season of science, we are thrilled with what we have already accomplished with this piece. "Red Planet Respite" has been a joy! Between the wonderful cast and crew, you our dedicated audience members, and the incredibly supportive staff at La Jolla Playhouse the process has been impeccable. As many have noted there are not many theatrical works that attempt to tackle the important issue of space travel and even fewer that manage to do it from a logical and scientific approach. Sure it is fun, but by using the theories of brilliant scientific minds we were able to inject a little bit of knowledge that will hopefully leave you thinking about how important science is. When you add the piece's ability to spotlight strong female characters we've really created something that is truly important to our modern cultural world. The shiw has become a hilarious, entertaining, touching, and poignant exploration of where our society is heading if we don't stop idolising the Kardasians and start listening to those who are activiely trying to prepare us for the future. This has been our largest theatrical endeavor to date and we are so glad to hear such positive responses from those who have seen it. If you haven't seen the show yet... you should as it is something pretty darn unique and you only have 2 more chances. So we hope to see you either tonight or tomorrow night at 8pm for a little trip to mars prestent in the Mendall Wiess Forum at La Jolla Playhouse. Tickets are available here or at the door starting 1 hour before the performance. -Original home-grown art based on the stories and opinions of community members- this time reflective of a handful of Astrophysicists and Space Engineers from the School of Earth and Space Exploration from ASU. -A unique and creative outlet of story-telling that reflects collaboration between community members, company members, and artists involved in the production. -Some of the most talented people in San Diego giving their guts to the stage. -And as always, fun. CCdd-specific fun. -A higher production value. Between the design team from Arizona and San Diego, to the beautiful Mandell Weiss Forum theatre itself- CCdd has taken a big step forward with what we’ve been able to develop in terms of what is on our stage. We reserve the right to return to our scrappy previous production value (something we’re incredibly proud of), however we think you’ll enjoy the fruits of our residency, and we know you’ll be able to experience what we are capable of with a little more than we usually have. -A more evolved script. While we never really consider CCdd’s pieces “finished”, this particular script has had a lot of hands, eyes, and ears on it since its inception at ASU in January. The script has been through the ringer and back, and this particular production reflects feedback from, and perspective of the original staging and beyond. We had the time to fine-tune, and we believe the outcome of this time and consideration is a fabulous one. -A little more street cred, and a little more support. This residency has brought new attention to our company, and that energy has definitely put a big fire under our butts. We recognize this is a big opportunity for us, so we are charged to impress, and do our best to live up to any hype we’ve encountered through the reception of this Residency opportunity. Even though all of these new developments are fabulous ones- we want our audiences to know that we will always remain true to ourselves. Our goal- above critical acclaim and financial reward is to serve the community that was brave enough to open their doors, and their minds to our experience. Our job is to bridge gaps in communication, to provide perspective from a different standpoint- and to inspire our audiences to open their minds and hearts to the rest of the world, and in this particular case, the universe around them. I promise you, that our shows will never stop doing that. I will always choose the community voice over popularity, and sometimes the acclaim that we could potentially receive if we “played by the rules of traditional theatre”. We will always work to make the best possible productions you could spend your money on- and you can always know that the piece is rooted in honesty, perspective, humanity, and a community that deserves to be heard. So come listen. Come see. Come experience this new ride. See what we do with this opportunity, and root us on. Because we can’t do it without you. I say this every time, and I mean it with my whole heart. Even now, especially now we need you. This is a huge moment in our history, and we need you to be part of it. Thanks for reading, supporting, and sharing the news about who we are and what we do. I can’t wait to see you at the show. -Katie Harroff. Artistic Director of CCdd, Playwright/Director of ‘Red Planet Respite’.